Enter a dark world filled with despair and threaded by hope where your ability to creatively strategize, learn and overcome unpredictable and unique challenges determines your fate. Dark Souls will demand your absolute concentration, unflinchingly punish your mistakes, but reward your ability to learn from death. Each challenge is a mind game met with endless combinations that will test your ability to creatively strategize a way to conquer unimaginable monsters and progress deeper into this bleak and forbidding environment filled with the un-dead. 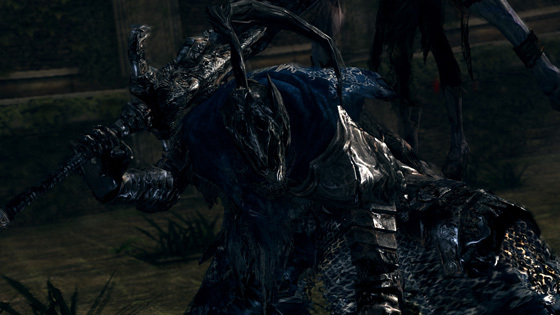 Dark Souls is the spiritual successor to the PS3 game Demon Souls. The game is characterized by its extreme difficulty and demanding nature. It difficulty stands out from most AAA games of its time as most AAA games were ones that held the hand of the players with a lot of UI information that can guide the player to his next destination. 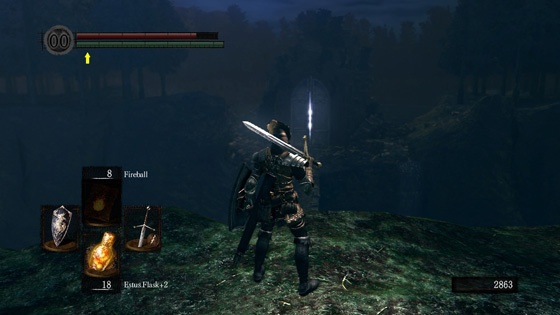 Dark Souls on the other hand handle giving direction to the player via framing and emphasis on the target destination. An elaborate example would be in its tutorial level. You will clearly see the door that is colored differently; The way it is also positioned when you exit from the previous section will also point you towards it. The game also lets the player have freedom whilst restricting the amount of decisions he can make. There are many different ways for a player to overcome a boss or a level. If a player thinks creatively enough and has enough information on how the game mechanics work, he can solve problems easier than how it seems. The designers were effective in employing their understanding of player pattern perception into use. The game conditions us to recognize similar patterns so that we may learn the game and how to progress, the game is also not afraid of breaking the built pattern to bring in more frightening experience to the player. A good example of breaking the usual symbol is the mimic. For the first half of the game you will encounter chests that contain loot. In Sen’s Fortress you can encounter your first mimic. It looks like a chest but if you try to open it, it will grab and munch your character. It reminds you that the world the game is set in is dark and treacherous. Its aesthetics are also top notch. My favourite phrase from an Honest Game Trailer of Dark Souls is: “Get lost in scenery that you’ll get lost in.” Since the game provides little to no information on where you’re supposed to go next, you will inevitably explore areas and be amazed at how gorgeous/terrifying the other places to explore look. 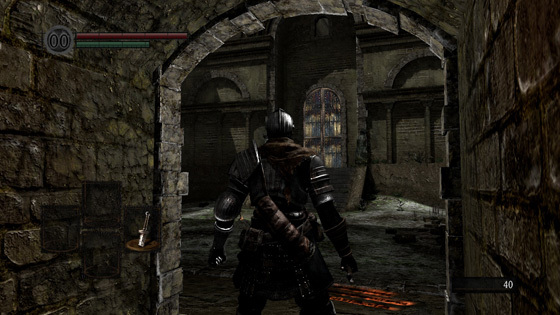 My favourite area is the final area, Kiln of the First Flame, it gives off a deteriorating feeling that even the final boss and his BGM will give. 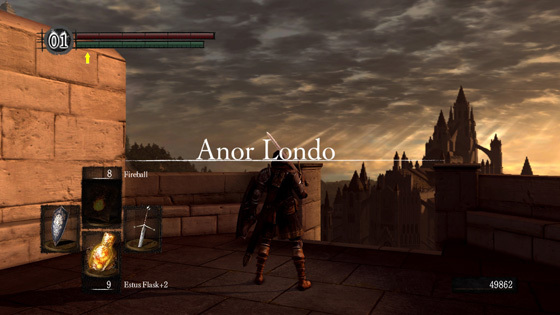 Dark Souls giving little to no information is also a way to get players search in the internet for solutions. In the earlier days of gaming where the internet was a scarce resource, finding for the right information was from word of mouth from friends or you’d need to buy a walkthrough. The game utilizes its player community sharing the answers to the in game dilemmas of other players. Another way to convey information is through the bloodstain. When you die, a bloodstain is left and other people can see your bloodstain and see how you died. This is yet another unique way to use mechanics to bring information to the player. The game’s difficulty also serves a way for players to stop and think about they need to do or what they have done wrong. The game being demanding demands you as the player to observe the little details that may help you in the future. Ambushes can be seen from different angles that you can notice if you did observe the area while walking. In conclusion, Dark Souls is a masterpiece for the new generation of games and will continue to influence numerous games in the future. About the Hyperdimension Neptunia series: "Hyperdimension Neptunia" is a series of RPGs setting place in a paradox world called Gamindustry. The games feature powerful Goddesses and their friends who embody different generations of game consoles. Turn-based System With A Free Roaming Style Battlefield: When the player's turn comes around you are able to move your characters freely within their moving ranging. Attack range will depend on the weapons equipped and by the skills they have. 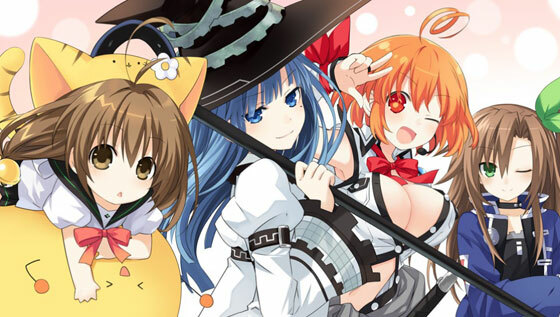 New, Returning, and Collaboration Characters: There will be new and returning characters, along with collaboration characters and story with various video game developers like Bandai Namco, Marvelous AQL, CyberConnect2, Broccoli, Falcom. 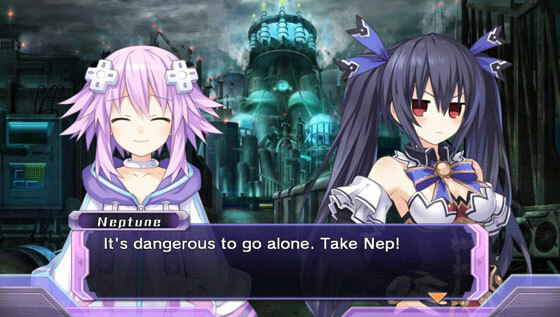 Hyperdimension Neptunia Re;Birth1 offers a joke-filled storyline that pokes fun at the gaming industry. Each collaboration character is a personified version of the "actual" company it represents. Enjoy in-game English & Japanese voices. 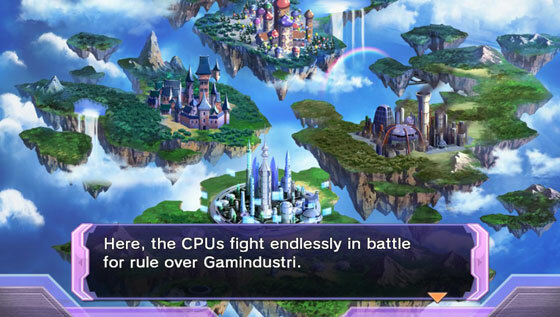 In the land of Gamindustri, there has been a conflict going on for centuries between four divine beings called CPUs. Each of them rule over a nation, and their conflict has been called the Console War. The four goddesses each reside over their own nation, with each nation representing a game console with Planeptune being the only one vague, but is actually representing the Sega Neptune. The rest of the characters are personifications of famous game companies with their avatars and/or movesets reminiscent of the famous game/s that the said company has created. Even the creator companies, Idea Factory and Compile Heart, make an appearance. What I think draws people in the game is the characters themselves. They all have colorful (though stereotypical) personalities. At a glance, we can immediately guess what kind of personalities they have, or at later moment, once we hear them speak (We can actually take this a step further for those JP VA fans, you can make an educated guess immediately once you hear whose voice it is. I mean, hearing Kana Ueda might tell you something about the character.) The usual character tropes can be found here as well. The game's main characters are purely female, so we can expect a lot of "boom, boooing" action. (This actually happens in-game). Admittedly, this game was really catered to the male demographic, but it at least caters to each of the preferences of people regarding women. Other than that, the one thing of note that will grab people's attention is how the goddesses look. I'm pretty sure women wearing skin tight suits is a sure way to get your eyes peeled, especially since they are the "main" characters. Adding the jiggle physics we have in the game, I'm pretty sure we have a lot of ogling happening, especially to Green Heart's "Green Hearts". Though the severe lack of important male characters, can give rise to hints of the characters being gay. Although it is only implied (sometimes, a tad heavily), it doesn't have an effect in the game. The players might get excited or appalled, but it depends on them. lol. In any case, the pairings are shown in the game for the player's enjoyment. One interesting part of the story, is how they break the fourth wall a lot, though with some edits, you can still enjoy the little references they dish out from time to time. Overall, there are a lot of things that keep Nep-Nep alive for the player, but arguably the all female cast would be the biggest factor on why players will try the game in the first place. I have had this site since I was a student in 1997, back when the Otaku Fridge was still hosted at GeoCities. 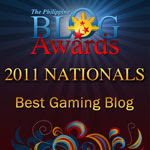 It has launched my career in web development and eventually helped me get into the game development industry. I have written so many game reviews that are more detailed than my anime or manga reviews. You may have noticed, however, that I haven't been reviewing anything for the past few months. I still could write game reviews when I became a game writer/tester and eventually a producer because the producer job entailed making sure all the developers were delivering on time while keeping the budget in check. Thing is, the longer I spent in the game industry, the harder it became for me to write reviews. 1. We already know our games' flaws before reviewers even mention them. We learn a lot in video game studies and game design classes. We know all the design principles. We have testers to tell us what's wrong with our designs. Thing is, the implementation is not as easy as it looks. I've spent a lot of sleepless nights trying to make conflicting features work with each other and yet frustratingly fail about 60% of the time. Which leads us to cut some features out or we'd never get the game shipped. Sometimes, we only learn how to fix conflicts in the next iteration, the next game project. So yes, we know what reviewers want to say and we'd like to do it the way most reviewers say we should. Truth is, we can't always. Many of us don't want to end up like these devs, whom I'm guessing have worn themselves out. "If I told you that there's more than 24 hours in a day, would you believe me?" 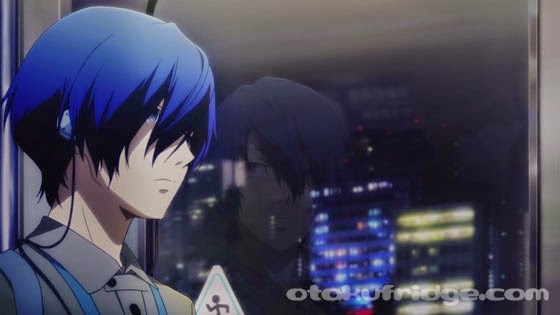 I have to admit that of all the Persona games I've played, Persona 3 is what I liked least. I saw the game as a transition from the darkness of the first three titles in the series and into the fun lightheartedness of the fourth. But if there's one thing you will remember from Persona 3, it will always be the supporting characters. For me, specifically, it would be sophisticated and intelligent Mitsuru Kirijo and the boxer Akihiko Sanada. I had no love for the silent protagonist, Makoto Yuki, so I was very detached from him when I finished the game. Heck, I even forgot the game's ending. To this movie's credit, Makoto's development as a character could actually be felt. He starts off seeming like a sociopath but then gradually develops a personality as he interacts with the other characters. 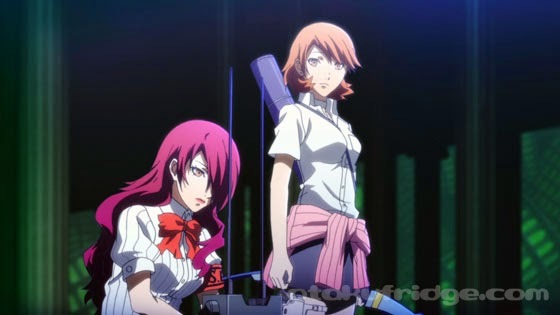 The women, Mitsuru and Yukari Takeba, are as fierce as they had been portrayed in the game. 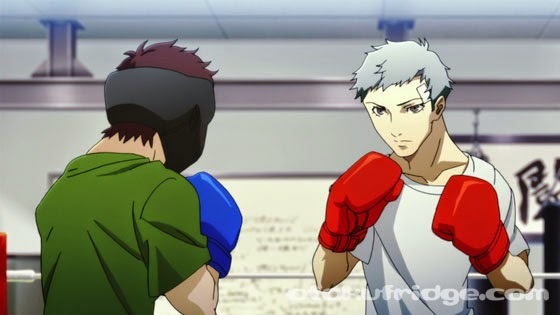 And Akihiko...well, I wish I could see more of him. The problem I noticed while watching Spring of Birth was that the events flow too fast. I appreciated that it reminded me of many game scenarios that I had forgotten but there were also some really fun aspects of the game that weren't shown due to the limited time. I wish they had turned this into a series, like Persona 4: The Animation, but I can also see that they might have problems keeping it as accurate as possible. As usual, I have no complaints about the music. Yay for Shōji Meguro! If there's one thing that's constant throughout the Persona games, it would always be my appreciation for their soundtracks. I'm glad to see that they're utilizing the music to its fullest in the movies as well. The visuals are also beautiful! 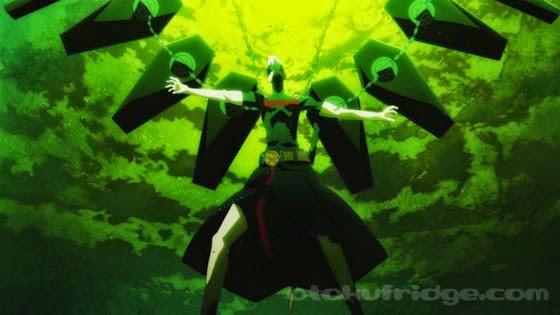 Without so many words, the film visually conveyed the darkness that surrounded Makoto's environment and Makoto himself. I haven't seen the second movie and I'm wondering how they're going to pull off the entire story with just three installations. I hope they slow down the pace a bit. (Which was exactly the opposite of my complaint about Persona: Trinity Soul, a spin-off non-canon series based on Persona 3, but that's for another review.) I was also disappointed that Makoto was the protagonist, actually. Yes, he is the canon main character, but his female version, for me, had better gameplay and story experience. She has a personality, too, and it showed despite her silence. It would have been more interesting to have her as the protagonist. I can't say much else, except that it's a good addition to your gameplay experience. Again, a rarity in movie/TV adaptations of video games. That's the thing, though. I felt that the Spring of Birth would be incoherent to someone who has not played the game. It's just too fast-paced and have little time for character development. So game first, movie after. Haven't done live action reviews in a while and this is a backlog post. Sorry about that! Anyway, I'm not going to do a full-blown review because this series is so short, anything too descriptive might be too...spoiler-y. What I'm going to say is this: If you had your childhood destroyed by the 1994 live-action Street Fighter movie, this rebuilds your childhood and takes it to the greatest of heights. And the story, though short -- it's a 14-episode series with 10 minutes run time per episode -- was very cohesive. Though I've seen some people complain about not seeing their favorite Street Fighter characters, I find that it leaves just enough for one season. Street Fighter: Assassin's Fist revolves around the origin of Gouki and Gouken, plus the development of Ryu and Ken's relationship as brothers-in-arms. If you're not after the story, which, by the way, is as close to the game as it can possibly get (with a few compromises here and there), you'd have lots to enjoy from the fight scenes as well. Anyway, don't just take my word for it. Go and watch it! This indie effort needs a lot of support and it has already proven that it can deliver. They also work quite fast, as they been showing some indications that they're already working on the second season.